Oil and water don’t mix; efficiency and profits often do. While the oil and water adage is well known to biodiesel producers — it means feedstock is contaminated with water — it also offers an opportunity. Biodiesel plant personnel are always looking for new tools and equipment that help a facility operate more efficiently. Oily water is a major hurdle to efficient processing operation. Water has several purposes in the biodiesel production process, including equipment cooling and the “wash” process. Therefore, water often picks up oil or grease from equipment and feedstocks. Regardless of whether the facility reuses the water or sends it to a municipal treatment plant, the oil must be removed. Many producers aren’t properly equipped to do so efficiently. Oil skimmer technology presents a possible low-cost solution. Oil skimmers are used in a wide variety of industries, including biodiesel and steel production, food processing, and wastewater treatment. The equipment continuously removes oil from the surface of the water using a simple process. Essentially, the equipment circulates a continuous loop of tubing across two pulleys. One pulley grasps the tube and feeds it onto the surface of the oily water. As it skims across the water’s surface the tube attracts the oil as it breaks the water’s surface tension. The tube “skims” the oil off the water before returning to the second pulley, which feeds the tube across two scrapers that pull the oil from the tube’s surface. The oil is deposited into a container for removal and the freshly cleaned tube travels across the first pulley and back onto the water. The skimming action provides the equipment its name and its many benefits. Oil skimmers are primarily designed to remove oil from water. While this is the technology’s objective, the reasons to use it are varied. The removed waste oil can be valuable to other industries that develop products with it. For example, facilities that create vegetable oils or animal fats can easily recapture the waste products, and provide them to other industries to make biodiesel, soap, and animal feed. Waste petroleum oil can also be recycled, cleaned, and receive additives that could create reusable oil. Biodiesel producers can also save money through water usage. Some facilities recirculate water after its treated. Others send it to a municipal water treatment facility. Either way, the removal of oil prior to treatment reduces costs and improves treatment efficiency, which can result in a reduced surcharge if water is sent to a treatment facility. An oil skimmer can also help reduce a facility’s costs of having an outside contractor haul away waste oil. Since the skimmer separates oil and water, the facility isn’t charged for the extra weight usually hauled away in the form of water. In fact, since the oil is typically water-free, it can oftentimes be used in the biodiesel production process. Oil skimmers also help prevent foul odors. An oily layer prevents oxygen from reaching the water, allowing anaerobic bacteria to grow and cause odors. Skimming can prevent safety hazards. For example, it can prevent clogs in lines and sprays by removing coolant’s tramp oil. Tramp oil removal maximizes the effect and life of the coolant and tool. Also, oil build up can create a fire or spill hazard. Finally, unlike time-consuming and costly manual skimming, an automatic oil skimmer continuously removes oil while unattended. It shouldn’t require constant adjustments or supervision in order to operate continuously. This is especially essential for a plant that is faced with minimal staffing, such as small-scale biodiesel or feedstock pretreatment facilities. Every oil skimmer is designed to accomplish the same thing — remove oil from water. However, not every oil skimmer achieves the same results. Certain features allow a skimmer to operate at its maximum functional level. First, a skimmer’s removal capacity should match the amount of oil that is generated. For example, a small oil skimmer should not be used to remove oil from a large oil spill. The skimmer should be able to skim under conditions where floating debris is present. It should also adjust to liquid level fluctuations and be constructed of a material that is compatible with its application. Additional products and accessories are available to improve the performance of an oil skimmer. These products are typically designed to accommodate a facility’s unique removal needs. A decanter returns any water removed by the skimming process to the skim tank. There are several situations in which a decanter should be used. If the skimmed oil is frothy, as is common in machine tool coolant, the decanter gives the solution a chance to separate from the removed oil and returned to the solution reservoir. This reduces solution loss. When the oil doesn’t enter the skimming area for long periods of time, the oil skimmer continually operates to protect against excessive discharge. When oil isn’t present, the decanter prevents an accumulation of water in the storage tank. A decanter can be used when oily waste disposal and/or oil reclamation costs need to be controlled. The decanter minimizes the quantity of water or solution accumulation in waste storage containers, thereby controlling costs. A pre-fabricated mounting system eliminates expensive bridgework needed to install the skimmer. It also provides safe and easy access to the skimmer. Used in conjunction with a skimmer, vapor hoods are used when oil must be removed from areas, such as tanks and sumps, where volatile organic compounds are present. They’re also used to protect the skimmer from harsh weather conditions. Oil skimmers are often used in cold weather. In order for the removed oil to be warm and fluid for processing, the oil skimmer needs to be equipped with a heating device such as a heat rod. 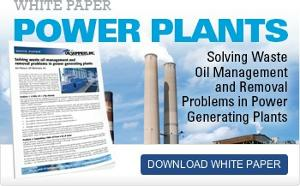 Waste oil doesn’t need to be a burden to plant personnel. An oil skimmer ensures that the oil is easily removed with minimal effort. The right oil skimmer allows a facility to effectively manage oil, and save time and money. Author: Jim Petrucci has extensive experience in the oil skimmers industry, having been with Oil Skimmers Inc. for 30 years. Reach him at info@oilskim.com or (440) 237-4600. More information is available at www.oilskim.com. The oil skimmer technology was on display at the 2007 National Biodiesel Conference in San Antonio, TX. The claims and statements made in this article belong exclusively to the author(s) and do not necessarily reflect the views of Biodiesel Magazine or its advertisers. All questions pertaining to this article should be directed to the author(s).